Turquoise Mountain is a charity that transformed Murad Khani, the Old City of Kabul in Afghanistan, from a war-ravaged district into a vibrant cultural, educational and economic hub. We wanted to give visitors the experience of walking the streets of Murad Khani, stepping into workshops and discovering a world of art, architecture and crafts. 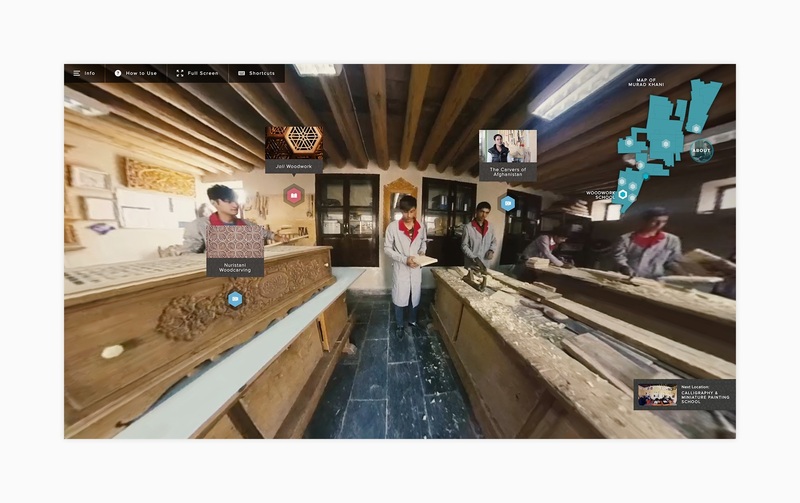 We did this through 360° videos that allowed visitors to virtually walk the streets and visit the workshops and historical houses of the institute. Pinned amongst these panoramas are links to various multimedia features that tell the stories of the people who are keeping Afghan heritage alive. We have already been working with Turquoise Mountain since 2014, starting with their main website and later, an iPad app for a major exhibition at the Smithsonian’s Freer Sackler Gallery. But the brief for this new project was different. Turquoise Mountain’s Kabul team had been recording videos and images of their classrooms, and the streets around where they work. They came to us to see how we could utilise this panoramic media. Through the original app and website, much of the work they do was already showcased, but this was an opportunity to better contextualise it - to give visitors a sense of place. Though the work of Turquoise Mountain work continues, there is a lot to celebrate now various restoration work is completed and the newly rebuilt schools are enjoying active use. Our hope is that by giving users of this experience a sense that they are ‘there’ - seeing the bustling life around them, we can go one step further to promoting and sustaining the work that Turquoise Mountain do, but perhaps more importantly raising the profile of artisans and their creative work yet further. Technically speaking this was an ambitious project. We joined up the excellent content management from Craft CMS to power an API to be consumed by Vue on the front end, allowing us to make a dynamic and responsive front end interface. We then used Three.js to map the 360 videos and images, and plot feature pins in a three dimensional space. Turquoise Mountain are able to create all the stories, upload 360° videos and images, and thanks to some custom plugin work, they can plot the pins making the entire app fully CMS driven. Identity and website for a property developer specialising in progressive, sustainable approaches to housing in Central and Greater London. Brand creation and website for online gallery of high quality prints by key contemporary artists such as Damien Hirst, Chuck Close and Peter Doig.